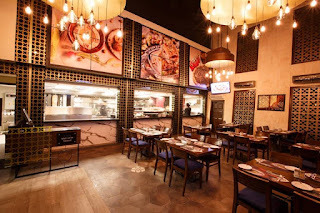 Middel Eastern Cuisine is not a new concept in Pakistan, especially because it is very similar to the flavors and ingredients we are comfortable with. Due to this very reason it was instantly welcomed when introduced in the Pakistani food culture. 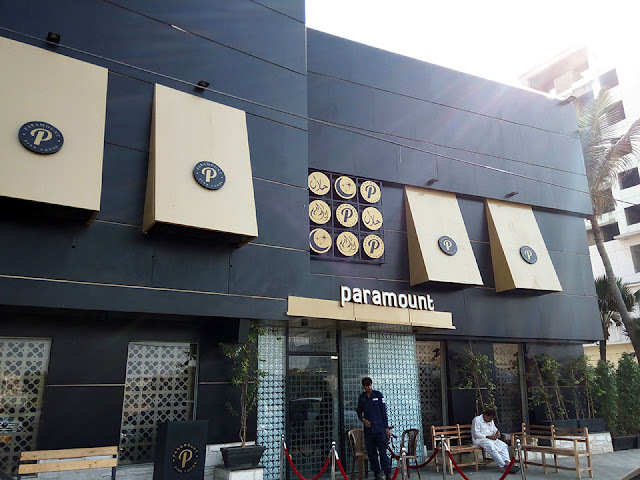 Paramount Fine Foods PK may not be the first to introduce Middle eastern cuisine but I heard that this eatery is bringing the finest of Middle eastern delights so I just had to taste it myself. 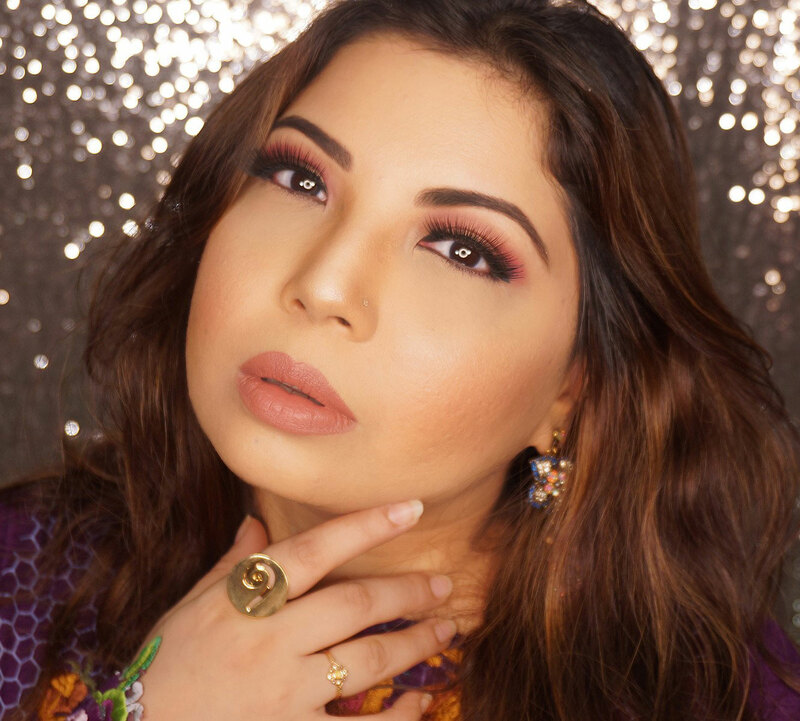 When we talk about Middle eastern food lets get one thing clear, we are not just talking about Dubai or the Arabs but the food of the various countries and people of Middle East. Iran, Turkey, Egypt, Syria and even Jerusalem (Israel) are part of it and so is the food culture. So what you experience at Paramount is not just ARAB food, got it? Good. P.s: Pakistan is part of Asia, not Middle East, ehem! Middle eastern food mainly comprises of olives, sesame seed (so much of it! ), mint, chickpeas and the flavors are mostly salty as well as tangy in most dishes. In general the cuisine is rich and aromatic. They also have a fondness of kebabs and meat like us desis; bring on some meat, yeah *Chest Thumping*. Paramount Fine Foods not only boasts about the quality of their food but emphasizes on making sure that the restaurant itself is welcoming in terms of interiors, staff and service. I was given a warm welcome, found the interiors a bit too wooden and brown yet organized as well as planned. Even with a full restaurant the service was reasonably quick and impressive. 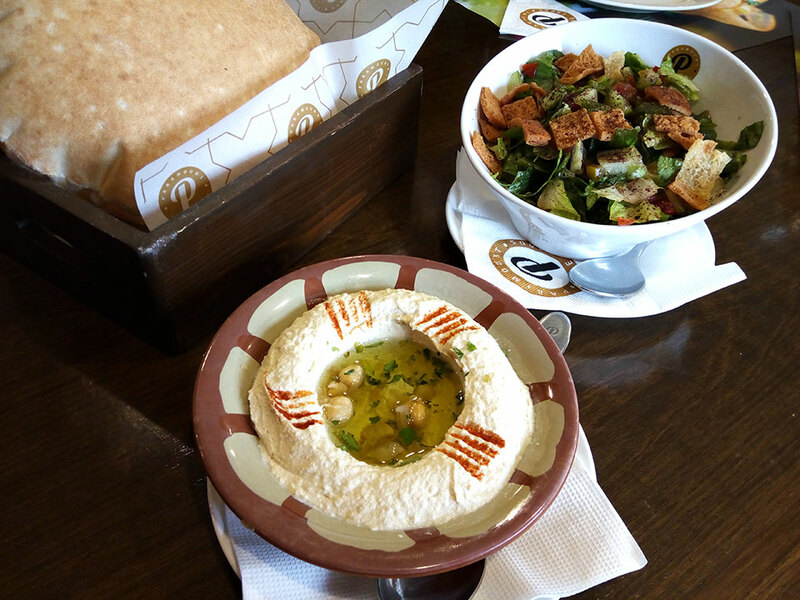 The indulgence in wholesome goodness started with, of course, Hummus along with Fattoush Salad. Fun fact: Hummus is one of the oldest dishes in the world. It's made of chickpea paste, tahini sauce and the right amount of olive oil. I can have it as a sandwich or burger spread as well, it is very basic yet flavorsome. The Hummus at Paramount had a good consistency, it was smooth and creamy with a tangy aftertaste, probably the olives. I particularly loved the Fattoush salad because of how fresh it was and the balanced mix of vegetables. I rarely enjoy this salad and this was the first time I did. I am tempted to recreate it. The items are simple, the dressing is the key and it was done well with the right amount of lemon juice, pomegranate molasses and vinegar mixed with olive oil. Next I sank my teeth in some good, desi -feels, Manakeesh flatbreads. You show these to a westerner and they will say "where da cheese?!" Yes, Manakeesh (also Mankish) do look like a middle eastern version of a Pizza, I think Pizza rules in different ways and forms in every corner of the world. I tried the traditional Zaatar Manakeesh which is basically thyme and the much loved sesame seed mixed with olive oil and spread onto the Manakeesh. It tasted surprisingly good even though I was initially doubtful. The taste is very earthy and unique due to thyme, toasty sesame seed and sumac spice that brings out a bit of tartiness,. The after taste is a bit dry so a drink on the side is advised. 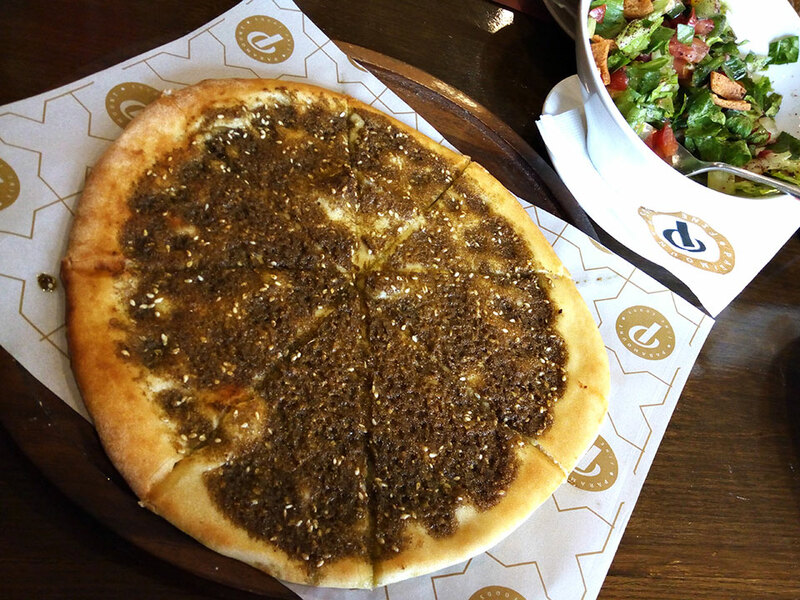 Zaatar Manakeesh is actually served as a breakfast dish in Lebanon and other middle eastern areas, wah! Other than aromatic Zaatar Manakessh we (I was with friends) had ordered a chicken cheese Manakeesh as well, to be safe in case Zaatar backfired. In the end the chicken cheese tasted fine but very ordinary so we stuck to the Zaatar Manakeesh and devoured every bit of it. If you think I was done by now you are so wrong. 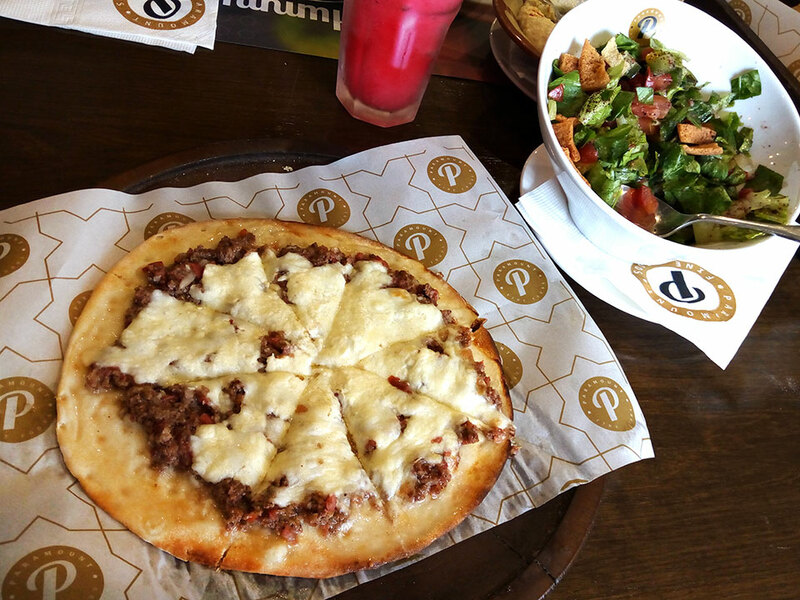 The main course came AFTER the Manakeesh, though to be honest you will be content after having those too. I was just curious about one of the main platters so left some space for more. We all ordered one big Mix Combo platter as that had a bit of almost everything Paramount was offering. From chicken and beef shawarma to Kafta skewers, Beef Sheesh touk skewers, Falafel and BBQ beef skewers served with tahini sauce. Yes, I was drooling too when I was reading the menu. 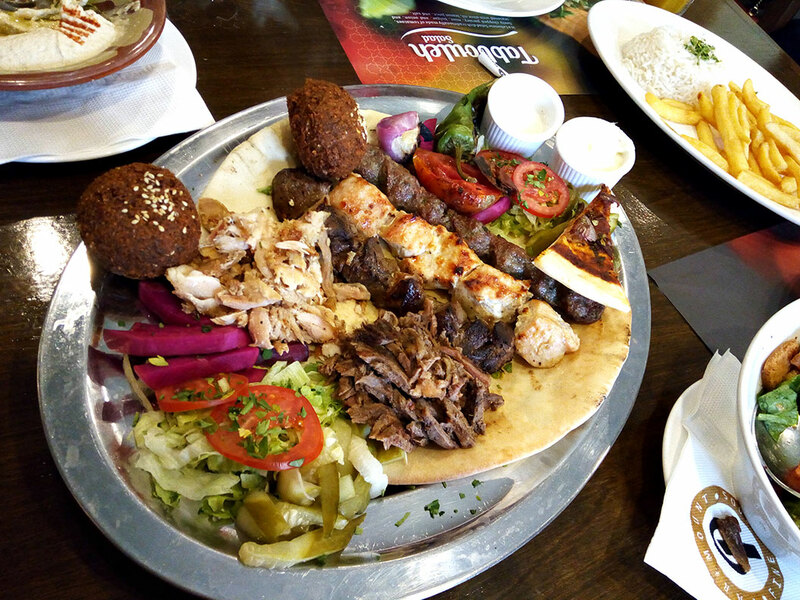 After trying a a little of everything on that platter I loved the Falafel and BBQ beef the most. The beef and chicken shawarma was bland and dry, the Sheesh touk and Kafta skewers were cooked well but were not flavorsome enough. The Falafel was too good to be true, best I have tasted in Karachi so far. The two different flavors of fried chickpeas, Crunchy from the outside while soft and fluffy from the inside, in one bite was eatremely pleasurable. The Chickpeas are grounded and mixed with onions, herbs and light seasoning and then fried with or without eggs and bread crumb. In Paramount's case there was a light batter covering the falafel which complimented it nicely. The BBQ beef skewers were juicy and peppery. I was glad they were not over cooked becuase that literally kills the flavor. Desserts? Well, you will not be able to resist a bite, or two, of the variety of Baklawas, Kinafe and Sh'aibiyat Paramount has to offer, each with it's own nutty, smooth or gooey sweetness. The food and experience is worth the cost which, as per generous portion size, is quite justified. .
You can check out more from their FACEBOOK page. Make reservations and go!